...To replace it with something new." 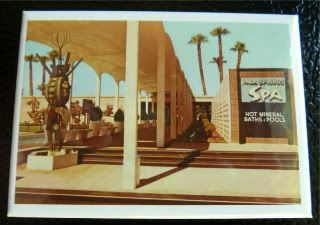 Anyway, I had forgotten about Palm Springs, CA - apparently people have been going there since the 1880s to take in the waters of the hot springs. (So funny, it's like the Bath of California). But, last century, it really became a playground for the Hollywood (and beyond) rich and famous - so much so that many celebs had their second homes, honeymoons and vacation getaways there. And I bet it must have been supercool with the likes of Cary Grant and Bob Hope and Elvis hanging out there. Add to that the cool mid-century Modern architecture of the town (which apparently has the largest concentration in the US), and I definitely have to add it to the California must-dos list!